Is the zombie apocalypse coming soon? Based on TV shows and movies alone, you’d certainly think so. Starting with Night of the Living Dead in 1968, there have been more than 50 years of zombie-related media crawling, staggering, and shuffling through cinemas and television sets across the country. Just a few of the most popular and enduring zombie movies and shows include Dawn of the Dead, Day of the Dead, Resident Evil, 28 Days Later, I Am Legend, The Walking Dead, and World War Z. Even if the zombie apocalypse isn’t right around the corner, have we reached “peak zombie” yet? It’s hard to say; given the collective creative minds out there – along with the endless fascination and awe inspired by those legions of undead – there’s a pretty good chance zombie-related flicks and features will be popular more than ever, maybe even 50 years from now! 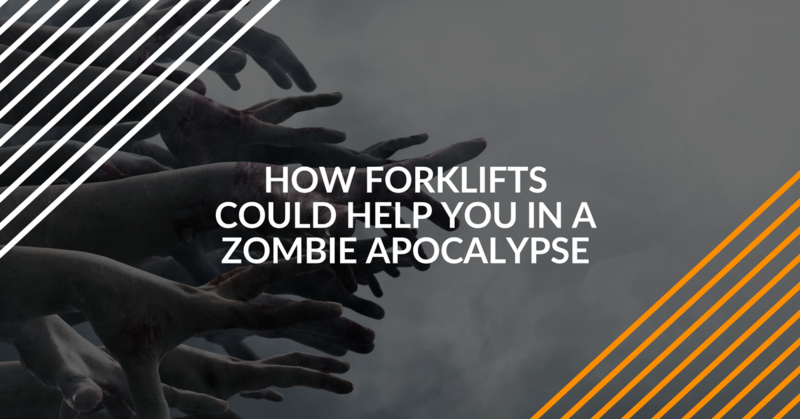 So you’re probably reading this blog and thinking – Okay, but how do zombies tie in with forklifts exactly? Great question – and we have some answers. Keep reading! Let’s look one of the most underappreciated tools for fighting the undead in the coming civilizational collapse: forklifts! But what about forklifts? Sure, they don’t exactly seem like an ideal thing to have when fleeing or fighting zombies, but consider their built-in benefits. Here are a handful of reasons why forklifts are helpful during the hellfire of the zombie apocalypse. Forks as weapons. During normal times, the forks are used for moving pallets, stacking cargo, and lifting merchandise in warehouses. Well, in a world overrun with zombies, forklifts won’t be used for normal tasks. Instead, they’ll be used as effective weapons to repel the walking dead! We recommend having the forks lifted as high as a zombie’s neck – remember Zombie Killing 101…a headless zombie can’t chase you! Escape vehicle. While forklifts aren’t exactly setting land speed records, they’re still faster than the average zombie. Which means that, if you can’t find a car or boat to escape in, hop onboard the closest forklift! Just make sure it’s fueled or properly charged. Some of the most efficient electric forklifts can run for hours on end, which should give you plenty of breathing room from those non-breathing zombies. Fort building. In the zombie apocalypse, you’re gonna need a place to fortify. Just like those survivors in Dawn of the Dead, it’s always a good idea to find a well-fortified building to keep the undead away. Forklifts can stack pallets and other heavy items against doors and windows for extra protection. Just make sure you have a buddy to spot while you’re making your fort – you don’t want to get surprised by soft-walking zombies. Scouting/raids. Large pallet jacks and rough terrain forklifts have enough room for multiple people. These types of forklifts are great for scouting out unknown areas since they can hold plenty of weapons and cargo. Always remember to fuel up for your next scouting trip! These are just a few helpful factors. Once you’re being hunted by zombies on a 24/7 basis, we’re sure you’ll be able to think of more – the survival instinct stimulates the imagination! Do you need any special certifications or training to hunt zombies in the coming apocalypse? Not likely. After all, with civilization teetering on the edge, who has time to go through the proper ways to impale the undead hordes, or fortify an empty shopping mall against raging zombies? But is training required to operate forklifts in the pre-zombie apocalyptic period? You bet. And there’s one way to get certified with OSHA in the most affordable, effective manner possible: with ForkliftCertification.com. Our training programs are designed to help beginner operators, veteran forklift drivers, and every skill level in between. Our modules won’t show you how to fend off zombies, but they will explain important OSHA safety regulations, and also prepare you for your forklift certification test (both the written and hands-on parts). If you need to become compliant ASAP, look no further than the OSHA forklift training experts right here at ForkliftCertification.com. Sign up today to get started. If you or your co-workers aren’t compliant, you risk severe penalties and fines from OSHA if you’re in an accident. For questions about getting compliant, what to expect with our courses, or assistance for fending off zombies, give us a call today at (888) 278-8896. Thanks for visiting our blog! And if this is the last thing you read online before the zombie apocalypse, well…from everyone here, thanks for making us your last internet visit. Best of luck fighting off those zombies! *The forklift uses and techniques explained in the Zombie Apocalypse section of this post are for entertainment purposes only. Always operate a forklift according to correct safety practices.